“By the spring of 1945, the school children of Hiroshima city had been ordered to evacuate from the city for safety. Many children had moved to live with their relatives in the countryside. Those who did not have such relatives were taken by their techers to schools or temples in rural areas and lived together there. “I was supposed to move to one such temple on August 9 with other pupils who were still remaining in the city. “On August 6, the day when Hiroshima was attacked with an atomic bomb, the hot mid-summer sun was blazing down since early morning and no cloud could be seen in the sky. “We got to school at 8 and lined up in rows on a schoolyard for the flag signaling drill. As food was scarce those days and children were not fed sufficiently, many fainted one after another under the scorching sun. Eventually we were told to rest for a while in the shade of the trees. “Boys who remained in the middle of the playground shouted, ‘Look, a B29!’ pointing at the sky. (Around that time, U.S. B29 bombers often flew over the city. Whenever they came, an air-raid alert siren sounded; so a B29 was a familiar sight to children). “I looked up and saw the silver-shining B29 plane flying high in the blue sky, drawing a white arc with its vapor trail. ‘That’s pretty,’ I thought. The next moment I felt a white flash. As I began to rush for an air-raid shelter, the hot sand from the sandbox blew strong against my back and pushed me down on the ground. “When we reached the shelter with my schoolmates, it was already crowded with people from the nieghboring areas and there was no room left for us. Soon we got drenched from the sudden rain, which we later learned to be the radioactive ‘Black Rain’. We cuddled up to keep ourselves warm, but we were shivering with cold. The sun looked to be gone with heavy gray clouds hanging over the sky. “The area I lived then was 2.6 kilometers from the bomb explosion center. There, most of the houses were destroyed by the blast, but they were not burned. Many injured and burned people fled to this area from the city center. The streets were so crowded with the injured that there was no room for us to walk. “My father was about 1 kilometer away from the explosion center. He was rescued from under a fallen building. He narrowly came back home, but he was bloodied all over his body due to wounds caused by pieces of broken glass. “My eldest sister, who was caught by the bomb at Hiroshima railway station, 1.5 kilometers from Ground Zero, came back home in the evening of the second day. She got burned on the neck and the back. As we had no medicine to treat her with, my mother put thin slices of cucumber on her back to cool down the burns, but the cucumber slices soon spoiled because of the heat. They began smelling and flies swarmed. We kept flies away from her, using a fan in turn. She could not sleep and kept on crying with pain. “My 13-year old sister was sick and stayed at home on that day. She survived. All her schoolmates who were mobilized to work near the city center on that day died. (At that time, the first and second graders of junior high school aged 13 or 14 were mobilized to work in building demolition to prevent the spread of fire in the central part of the city, and many of them died or are still recorded as missing). “Almost every family in my neighborhood had victims of the bomb: they got injured or burned or they were missing. “A good friend of mine in the neighborhood was waiting for her mother to return home with her 4 brothers and sisters. Later, she told me that on the second day after the bombing, a moving black lump crawled into the house. They first thought it was a black dog, but they soon realized it was their mother; she collapsed and died when she finally got to her children. They cremated her body in the yard. “Around the third day, the dead bodies lying on the streets were brought to the playground of my school. They were put in ditches one after another and cremated. The town was filled with the smell of burning bodies every day. According to the records, about 22,000 bodies were cremated here. “The defeat of Japan in the war was announced on August 15, but food shortages continued. In my school, in the spring of the following year, we planted seedlings of sweet potatoes in the schoolyard. On the day of the harvest, as we dug the ground, human bones came out with the potatoes and we screamed to see them. The potatoes were served for lunch, but we could not eat them. “After Hiroshima, another A-bomb attack was made on Nagasaki on August 9, 1945. Those who were exposed to the heat rays, blast and radiation of the A-bomb totaled about 600,000 in both cities. By the end of the year, 140,000 people in Hiroshima and 70,000 in Nagasaki had died. 42% of them are still missing to date. “Even 64 years after the bombing, we survivors still vividly remember those who desperately cried for help: their cries and memories are not gone; we are still tormented with remorse that we could not help them. Many of us also are suffering from the after-effects of radiation and from the fear of death. “I sincerely hope that people all over the world understand how a single atomic bomb could destroy a city and kill a large number of people indiscriminately and cruelly. 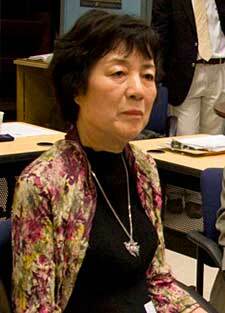 “We Hibakusha call the atomic bombs ‘weapons of the devil’. We cannot allow even a single bomb to exist on this planet. “Nuclear weapons should be abolished to ensure a peaceful future. “The damage of atomic bombings should not be repeated. “The pain of the victims of that day must not be forgotten. “We must not allow nuclear weapons to continue to exist. For filmed testimony visit the video page of our website.